Hi everyone! I wish I had been able to finish a new quilt for this fall's Blogger's Quilt Festival, but with our recent move and the fact that we are living in temporary housing (just for 2 more weeks! ), that just hasn't been possible. So for my entry, I ended up deciding on a quilt I made for my oldest son back in 2004. I had just had my second baby and wanted to make him a baby quilt, and I also decided my then 4-year-old needed a bigger quilt as well. There weren't really sewing blogs back then, but I found an online quilting message board where I participated in a 4.5" I-spy charm swap. The fabrics were swapped in pairs, and I made my boys each a "matching quilt." So each square has a match and it's kind of fun to try to find the matching pairs of kitty, or cow, or ghost, or whatever fabric. I decided to sash this one with 1" strips of black fabric, and I love how it turned out. It's quilted with variegated brightly colored thread, but I don't have any other pictures of this quilt at the moment. 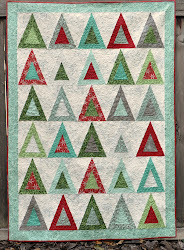 Don't miss out on the rest of Blogger's Quilt Festival! Check out all the great quilts at Amy's Creative Side. What a great idea, they have to 'share and work together' to find the matches. I love I Spy quilts - and having matching ones is super awesome! I'm so with you. I blogged my entry from my hotel room between bouts of house hunting. Your quilt is great! 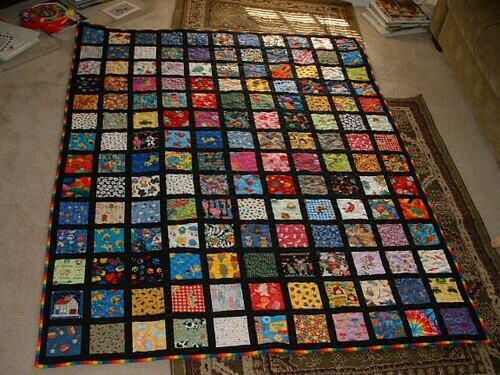 Love the story of internet quilting groups pre blogs. Great black sashing, too. I'm sure your boys have had a blast with them! This is a great I-spy quilt. I love how the striped binding sets it off. I love this idea! My kids are alwasy asking me to make them new blankets (they are big blanket lovers) and if it's ok with you I would love to use your idea for my kids. I think it great how a simple game can turn into a beautiful piece of art. Thanks for sharing! It looks like a wonderful quilt to play i-spy with your son while cuddled up under it. Hopping over here from the festival and loving your I-Spy quilt! I really like how the black sashing sets everything off. I'm currently collecting I-Spy squares in hopes of making one like this. I hope you're moving transition in a smooth one! What a fun idea! Looks like a great quilt and I agree, the black smashing makes it pop!